The good news is that you really don't need that many ingredients. I found the Almond Meal/Flour at the grocery store. You will need a kitchen scale, a sifter or mesh strainer, and some parchment paper. I used Reynold's parchment paper I bought at the grocery store. 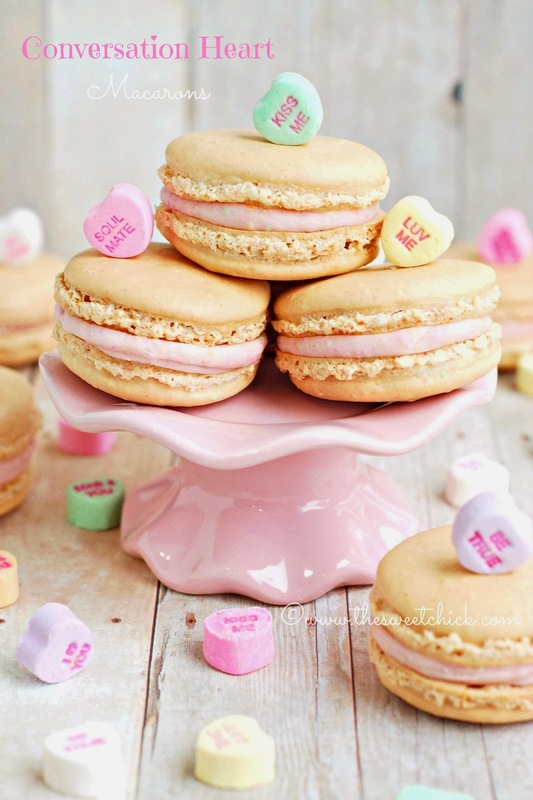 You have to sift the flour, powdered sugar and crushed candy hearts in order to have a smooth batter and nice flat macarons. I Used Brach's conversation hearts candy. They have fruity flavors, not as chalky as the Necco ones. It's best if you sift twice. I know it seems like a lot of work, but it is worth it in the end. For the conversation hearts I chopped them up a bit with a knife before putting them in my food processor to turn them into powder. The other day I used my Blendtec which also worked well. They need to be a very fine consistency. If you have a stand mixer, whipping the meringue is easy. If you don't have stiff glossy peaks, just whip it some more. I used egg whites in a carton, so I didn't have to worry about getting yolks in the mix. Look at those "feet", that means it worked. The template for the macarons that I made at Sur la Table were for mini macarons. I wanted someting a bit bigger. I made my own template on a piece of paper using a 1 1/2 inch circle guide. You can make yours on the computer if you want. I think next time I will make my circles a little further apart. They should be atleast a 1/2 inch apart. Other than that my template worked out great. I just slipped it under the parchment paper and piped my macarons. This time for piping tip, I used Ateco # 806. When I make these again, I may even go lower like a #804 or #803. For the filling, I chose a buttercream. It lent itself better with the candy. The crushed candy gave the buttercream such a pretty pink color that I didn't want to ruin, so when I added the vanilla, I chose to add a clear vanilla that I keep on hand for when I want a pure white frosting. It added just the flavor I need without changing the color of the filling. 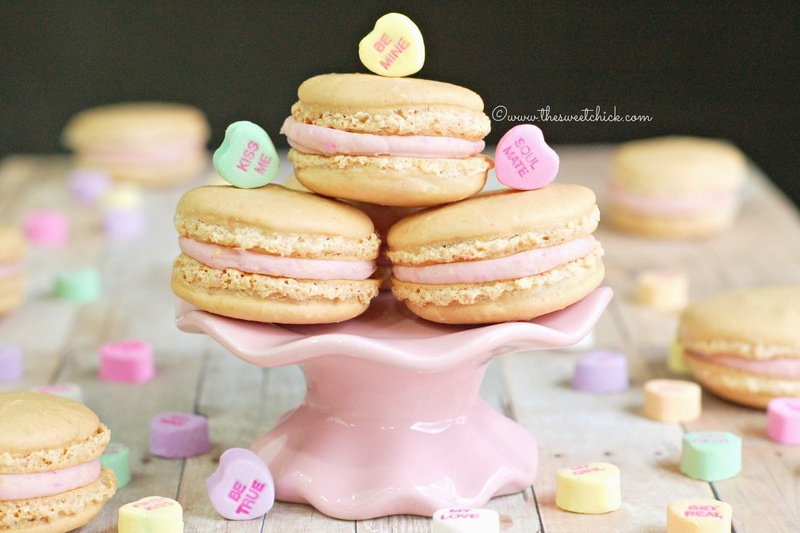 If you like conversation hearts candy, you are going to love these macarons. 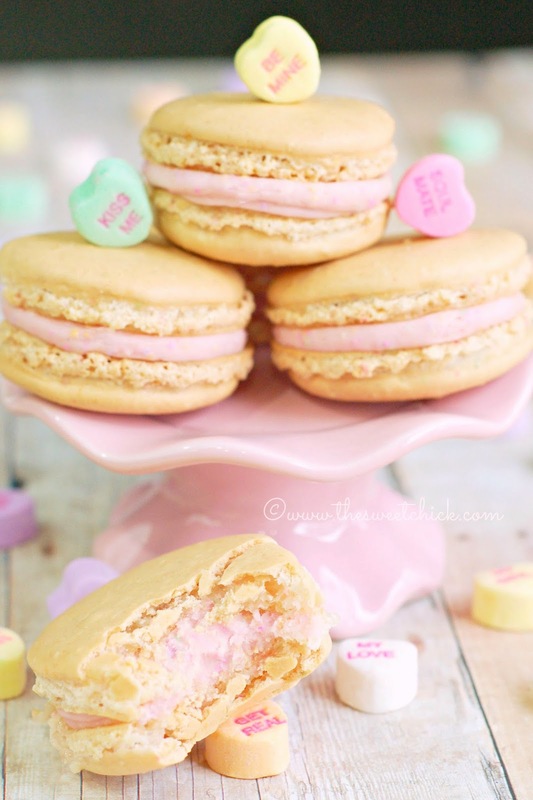 They taste just like the candy, but in macaron form. How cool is that? The shell is crispy, the inside is soft, and the filling is just the right amount of sweetness. I am so in love with these. They would make a great gift for someone you love on Valentine's Day. Prepare circle templates and line baking sheets with parchment paper, placing template under parchment. In a food processor, pulse 1/3 of the powdered sugar and all the almond flour to form a fine powder. Then sift sugar mixture 2 times. Sift remaining powdered sugar 2 times also. In a large bowl combine almond flour mixture and remaining powdered sugar. 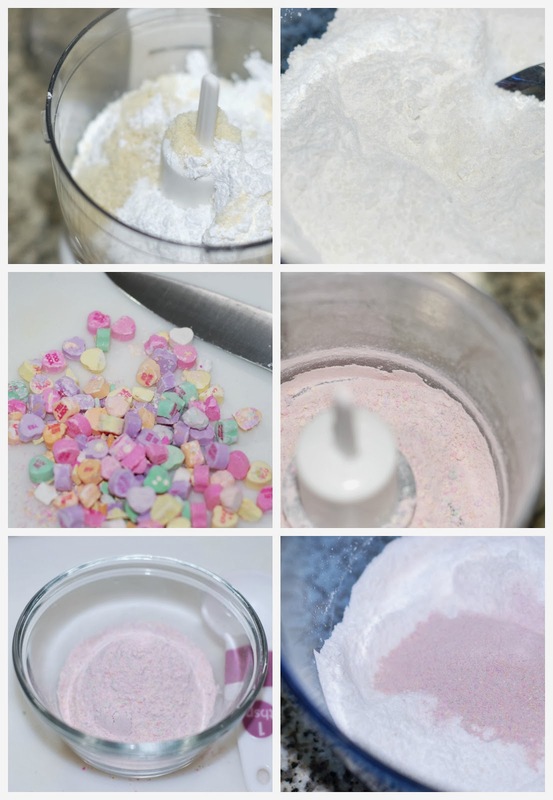 Chop or break up the candy hearts and then place in food processor. Grind until they become a fine powder. Sift candy powder 2 times. Add candy to powdered sugar mixture and mix well. Set aside. 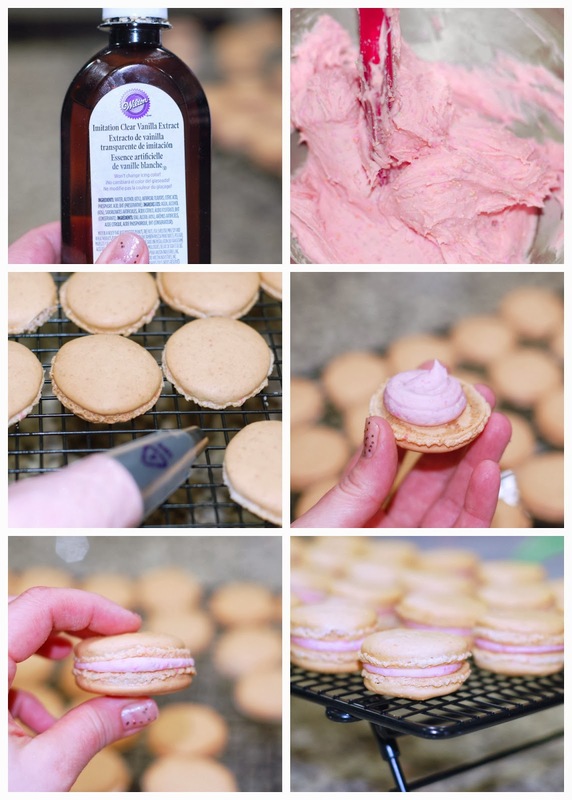 Place the macaron mixture into a piping bag with a round tip ( I used Ateco # 806). With piping tip 1/2 inch above the template , pipe 1 1/2 inch circles onto parchment paper lined baking sheets. Once finished gently tap baking sheet on your work surface to release and air bubbles and help form the "feet" of the macarons. 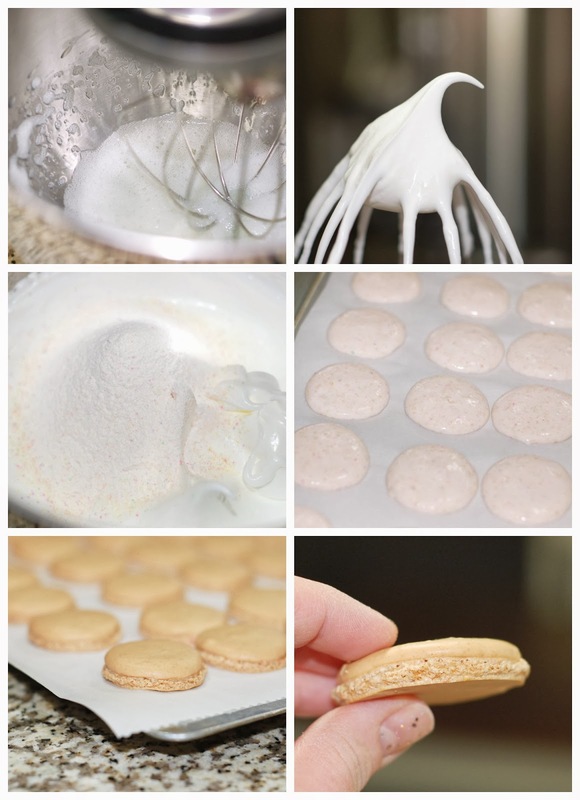 When ready, bake the macarons at 375°F for 10-15 minutes. (Mine took 13 minutes.) Rotate baking sheets halfway through to promote consistent baking. Macarons will be ready when they are crisp and firm. In a stand mixer, cream together the butter and powdered candy. Then slowly add the powdered sugar and mix on low until fully combined. Next add the vanilla extract and 2-3 teaspoons of milk. 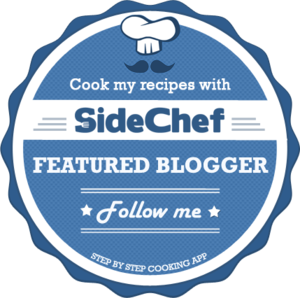 You want the consistency to be smooth and spreadable. Mix well. Place filling in a piping bag with round tip (I used Ateco #804). But before you go pop one in your mouth, I ask that you have just a little more patience. Macarons should be placed in the fridge for 24 hours before eating. This is how they mature and reach their full flavor. You can eat one right away, but when you eat one the next day it will be so much better. I know it will drive you crazy, but it will be worth all your hard work. I weighed the powdered candy after sifting because it tended to have a lot of bits that didn't go through the sifter. LOL. They are not that bad to make. You just need to relax and have patience. I love macarons. There's a bakery in my town that makes some tasty ones. I'll have to try these on my own. From the That's Fresh Friday. We don't have any around here, so it's a good thing I have learned to make my own. Oh my goodness, these are too cute! I've tried making macarons several times and while they tasted good they did not come out as beautifully as yours. What a fun Valentine's treat! Well, my first ones were not that great. But this recipe is pretty simple so it gives me confidence to try again. Oh, these are just beautiful, and I am so happy to be reading your post on Valentine's Day- how perfect! I really enjoyed the in-depth instruction- I almost feel like I was getting an in-person tutorial! Your photography is lovely. These little beauties have been PINNED! Thank you for bringing them to Treasure Box Tuesday!